Owning a home in retirement can give people some financial security that renters lack. Retirees who own their homes outright are often at an advantage over their renting counterparts. There are two reasons for this: Their housing costs are generally lower, and they have access to safety-net cash in the form of home equity. However, all home ownership is not created equal, explains Russ Thornton, financial adviser at Wealth Care for Women in Atlanta. For example, if you move often, owning a home outright by age 62 can be challenging. For most people, a 30-year mortgage is the norm. If you plan to retire by 65, then you would have to buy a home by 35 and stay in it to retire mortgage-free. Devising a long-term plan, including what home ownership looks like in retirement, is important, Thornton says. Since the big goal for retirement is to eliminate as many expenses as possible, erasing a monthly housing payment is optimal. In essence, renters who plan on staying in the same general area for years to come should consider buying. Home owners can say goodbye to monthly mortgage payments. The twin bridesmaids of finances are income and expenses. When people retire, the money coming in usually shrinks, which means so should the money going out. A mortgage payment is one expense soon-to-be retirees should try to retire before they do. “If you can be mortgage-free by the time you reach retirement, you’ll be in a good position,” Thornton says. Mortgage-free retirees can save hundreds or thousands of dollars each month. Even with property insurance, which costs an average of $93 a month, and taxes, the cost of owning a home is often less than renting. Not only can retirees save on their housing costs, they can also make money on their homes by renting out a room or turning part of their house into a short-term rental such as with Airbnb. Downsizing can also save you money. Going from a large family home to a cozy condo or smaller house can reduce utility costs, as well as allow you to cash out some equity in your home to fatten your nest egg. Home owners can access home equity, if needed. With working years behind you, having a backup generator of cash is a good thing. There are several ways homeowners can tap the equity in their home without putting up a for-sale sign; two of the most common ways are a cash-out refinance and a home equity line of credit, or HELOC. Equity-rich homeowners who want to lower their mortgage interest rate might consider a cash-out refinance. This increasingly popular option hit peak numbers in the second quarter of last year, reaching $16 billion of equity cashed out, the highest since 2008, according to a report by Freddie Mac. A cash-out refinance is almost like selling your house to yourself. The bank would cut you a check for the equity, which is the difference between what you owe on the house and the market value. If your home is worth $200,000 and you owe $100,000 then you have $100,000 of equity in the home. Banks usually limit the amount you get to 80 percent of the total equity. That means with $100,000 in equity, the bank might give you $80,000. The amount you qualify for is usually based on income, credit score, and other determining factors. Now comes the tricky part: When you do a cash-out refinance, you’ll get a new mortgage. If your interest rate is high because of poor credit or market conditions and you think you have a chance of getting a lower interest rate with a new mortgage, then a cash-out refinance might be an appealing way to access your equity. However, if your mortgage interest rate increases with a new mortgage, then you should consider other options, such as a home equity line of credit, or HELOC. Something else to keep in mind is the fact that a new mortgage usually means going back to square one if you choose a longer term. If your house is a few years away from being paid off, restarting the clock is probably not a good financial move. You’ll end up paying years more in interest and increasing your debt burden. Even with a mortgage, home owners have liquidity options. For people who want to keep their homes and existing mortgages while tapping their home equity, one alternative is a HELOC. HELOC lenders use the equity in your home as collateral to extend lines of credit over a fixed amount of time. Like a cash-out refinance, lenders typically cap the credit amount at 80 percent of the total equity. Some places, such as Navy Federal Credit Union, go up to 95 percent of the total equity. The benefits of HELOCs are that you pay only on what you use, and the interest is tax deductible if you use it to repair or upgrade your home. For retirees who want to retrofit their homes to make life easier, such as installing stair lifts, grab bars and handrails, a HELOC could be a good way to fund those upgrades and get a tax break. Before you decide on a lender, make sure you understand the terms of the HELOC and any associated fees, says Johnna Camarillo, assistant vice president of equity processing and closing at Navy Federal Credit Union. “Before you get a HELOC, ask yourself: Can I afford the payments if I max this thing out? Every person is different, so it’s important to look at your budget and not overspend,” Camarillo warns. 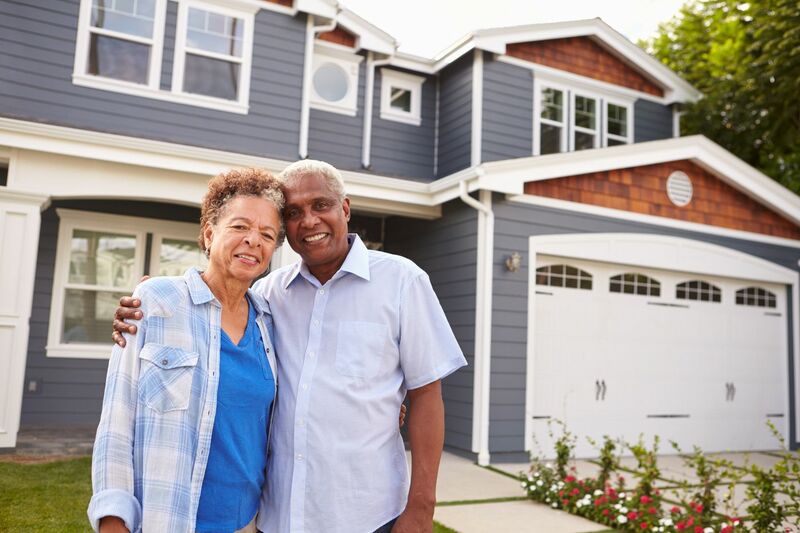 Retirees who own their home are going to qualify for a HELOC more easily than someone who holds a mortgage, which is beneficial if emergencies come up and you need to borrow a chunk of cash. HELOCs normally have lower interest rates than credit cards or personal loans, making them an attractive option for homeowners. It’s important to remember that once you use that equity, it will likely take years and even decades to rebuild it. “Home equity is like a bar of soap — the more you handle it the smaller it gets,” Thornton warns.